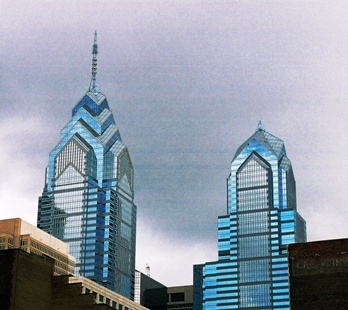 Center city Philadelphia is dominated by two high rise office buildings, known as One Liberty Place and Two Liberty Place. These two structures were completed in 1987 and 1990 respectively, and are the two tallest buildings in the city. One Liberty Place is the taller at 945 feet. Two Liberty Place stands 848 feet tall. The two towers were the first in the city to exceed the height of City Hall (510 feet). Prior to their construction, there was an unofficial rule which stated that no building in the city could be taller than William Penn's statue which sits atop City Hall. Since the construction of these two buildings, other high rise buildings have been contructed which also exceed the height of city hall. 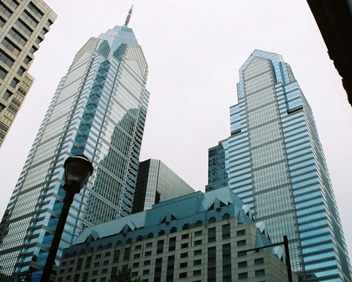 Liberty Place is located at 17th and Chestnut Streets.